This shower curtain is fun for kids and adults. TThis shower curtain is designed and produced by well-known German brand Kleine Wolke, established in 1968, and is backed by their quality guarantee. A luxury, quick-dry and easy-care polyester fabric, as used in many high-end hotels. Our Script shower curtain design features positve words and phrases in lime green, deep red, grey and deep bright orange on a white background. 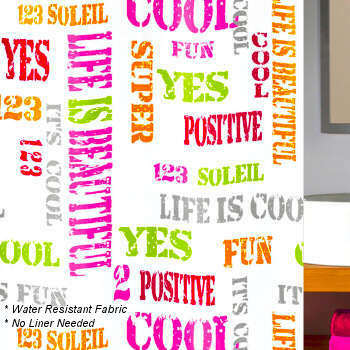 The fun phrases include life is cool, yes, positive, life is beautiful, and more. This design is available in a tub width size with 12 eyelets.